Reviews the issues with labeling, language, and the various types of disabilities and their associated conditions. 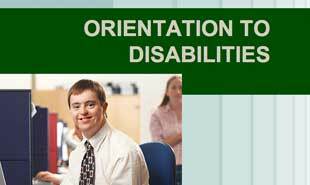 Provides an excellent orientation to the disability field. Useful with new staff, board, or family members. It reviews the issues with labeling, language, and the various types of disabilities and their associated conditions. Covers developmental landmarks and a review of the historic challenges people with disabilities have faced, from institutionalization to the growth of community services and self-determination.